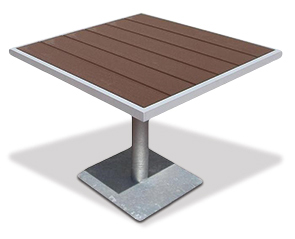 Revitalize patio seating and dining areas with inviting café tables that are built ready for indoor and outdoor use. Constructed with environmentally friendly recycled plastic and powder-coated aluminum materials ensures these tables will maintain their original form—withstanding continued exposure to seasonal elements. 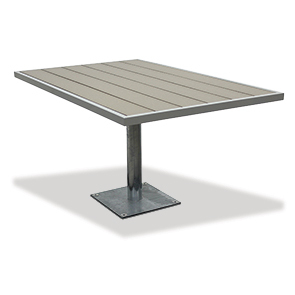 Designed to promote inclusion the rectangular ADA compliant table tops provide adequate seating for up to four people. Surface and in-ground mount models are available in a popular selection of powder-coated finish color options. Create a distinguished, blended setting with matching backless benches and side chairs.